"Natural Home Decor" was the last of the Kinfolk Community Gatherings for 2013. 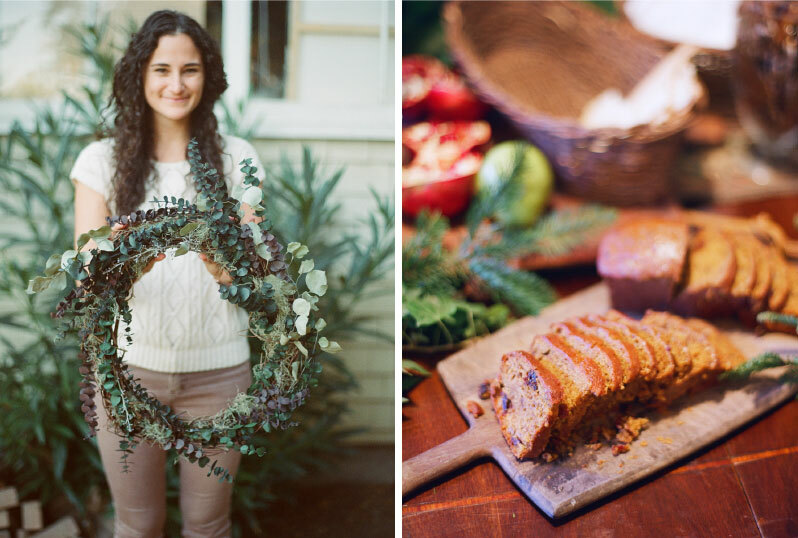 In Santa Barbara, that meant wreath making with materials harvested from nature. The location was an old Victorian home in downtown Santa Barbara filled with antiques, old world holiday decor and the cozy scent of freshly baked goods. Guests enjoyed Mulled Wine and Hot Apple Cider as they gathered for the workshop. They found there spot at the table under a canopy of ivy, pepper berries, hydrangeas, holly branches… all harvested and to be used in our wreath making project. As floral designer Victoria Wanberg showed us how to design and assemble our wreaths, she talked of seeing the beauty all around us and taking design cues from nature… something she learned from her father. Some wreaths took shape quickly, some took the entire afternoon… but we were all proud of our beautiful creations and inspired to create more from the natural beauty around us. As we finished up, we wandered into the house to enjoy a delectable spread of winter pastries, breads, and an amazing cheese tray… and, of course, more mulled wine. Chef Ashley Mulligan Shultz put together a beautiful feast for us, shared stories, and some recipes as we wrapped up the afternoon. We toasted an amazing year of Kinfolk gathering and shared in some cozy holiday cheer! Can't wait to see what next year holds for Kinfolk and Fruitful Collaborations!